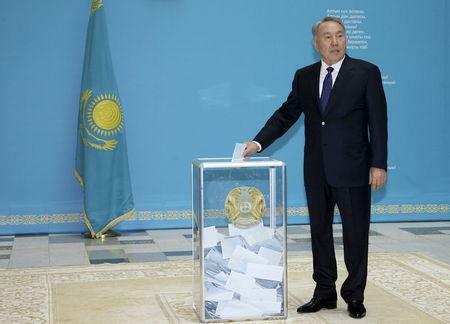 ASTANA/ALMATY (Reuters) - Kazakhstan's long-serving President Nursultan Nazarbayev apologized on Monday for winning re-election with 97.7 percent of the vote, saying it would have "looked undemocratic" for him to intervene to make his victory more modest. Sunday's election gives another five year term to the 74-year-old former steelworker, who has ruled the oil-producing nation since rising to the post of its Soviet-era Communist Party boss in 1989. Central Election Commission data showed turnout was 95.22 percent. Television showed a triumphant Nazarbayev walking on a red carpet, smiling and shaking hands and greeting thousands of jubilant supporters at what officials called "The Victors' Forum" held in a spacious stadium in the capital Astana. "Kazakhstan has shown its political culture to the entire world," he told his supporters. At a later news conference, he said of the poll results: "I apologize that for super-democratic states such figures are unacceptable. But I could do nothing. If I had interfered, I would have looked undemocratic, right?" Nazarbayev is lionized by compliant state media and is officially titled "Leader of the Nation". He is permitted by law to run as often as he wishes. Most of his vocal opponents have either been jailed or fled abroad. The Organization for Cooperation and Security in Europe said in an election observation report there was a lack of a credible opposition: "Voters were not offered a genuine choice between political alternatives," it said. The multi-ethnic, mainly Muslim country is stable in a region troubled by ethnic violence from Kyrgyzstan to Afghanistan. Nazarbayev has promoted "a multi-vector policy", building good ties with neighboring Russia and China as well as the United States and the European Union. The election was called more than a year before Nazarbayev's term was due to end, averting the risk that another year of economic pain could develop into a more serious challenge to his leadership. It also puts the question of a possible successor, an important issue for investors, off the table for now. Nazarbayev moved to allay speculation about a further depreciation of the national tenge currency. Kazakhstan devalued the tenge by 19 percent in one move in February 2014, but since then the currency has strengthened against Russia's sanctions-hit rouble, fuelling speculation of a further depreciation after the early election. "There will be nothing of the kind after this election," Nazarbayev said. "Russia will weather these conditions, sanctions just can't be eternal.... Ukraine will finally be back to normal, any war ends in peace."